Photo courtesy of Noresa Nickels The Galion Lady Tigers Airyona (AJ) Nickels running in the regional cross country meet on Saturday at Hedges Boyer Park in Tiffin. Nickels would see her season end, finishing 26th overall. Photo courtesy of Noresa Nickels Galion's Braxton Tate nears the finish line of the regional meet at Tiffin's Hedges Boyer Park. Tate finished seventh overall to advance to next week's state meet at National Trail Raceway in Hebron. 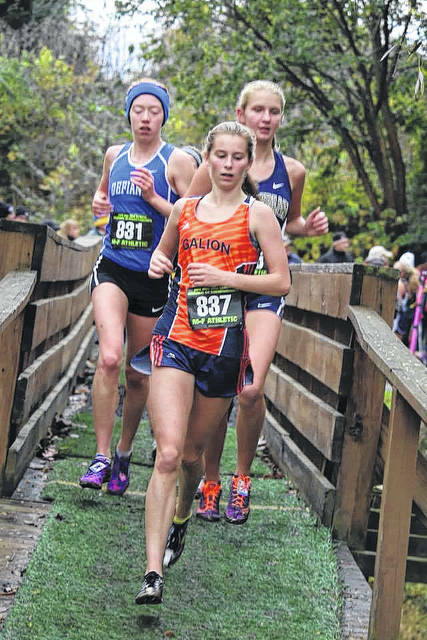 TIFFIN — The Galion Tigers cross country teams saw their season end last Saturday, Oct. 21 at the OHSAA Division II District meet. However, Braxton Tate and Airyona (AJ) Nickels continued their respective seasons on Saturday, Oct. 28 at Hedges Boyer Park in Tiffin at the regional meet. 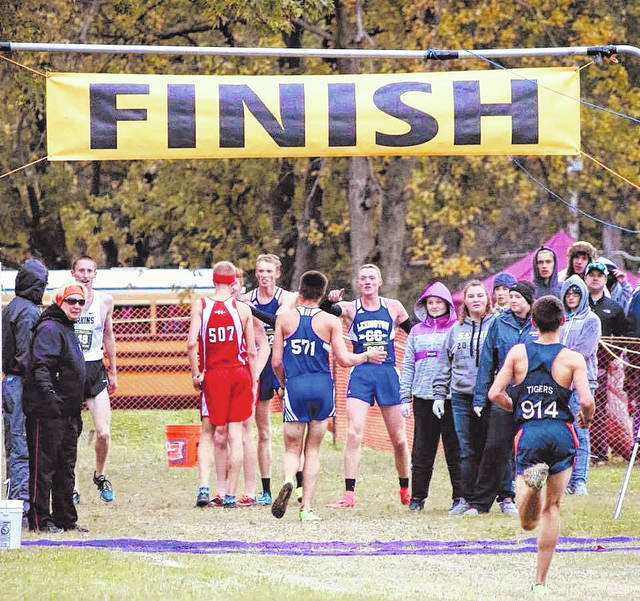 On the boys side of the event on Saturday, the top three teams, as well as the top 12 individual placers would punch their tickets to the state meet at National Trail Raceway in Hebron to be held on Saturday, Nov. 4. Tate, a sophomore at Galion, would be the proud owner of one of those tickets, earning a place at the state meet by finishing seventh overall in the boys field with a time of 16:25.14. Ryan Johnston, a senior on the regional champion Lexington team, won the event with a time of 15:38.78. Team placements on the boys side of the regional meet were: 1. Lexington; 2. Shelby; 3. Van Wert; 4. Milan Edison; 5. Wauseon; 6. Perkins; 7. Huron; 8. Eastwood; 9. Ottawa-Glandorf and 10. Genoa Area. There were 82 total finishers in the boys event in Tiffin. Over on the girls side of the regional meet, the top four teams and the top 16 individual places would advance to next Saturday’s state meet in Hebron. Nickels would finish her race with a personal best time of 20:46.90, but would not make the cut as she finished 26th overall. The final individual qualifier was Katie Crites, a junior from Defiance, finishing in 20:09.39. Carina Weaver, a junior from Lexington, won the race with a time of 19:15.44. Team placements on the girls side for the day were: 1. Lexington; 2. Defiance; 3. Milan Edison; 4. Toledo St. Ursula Academy; 5. Ontario; 6. Napoleon; 7. Celina; 8. Tiffin Columbian; 9. Bryan; 10. Bellevue; 11. St. Marys Memorial; 12. Clyde and 13. Norwalk. There were 105 total finishers in the girls event at regionals. The Galion Lady Tigers Airyona (AJ) Nickels running in the regional cross country meet on Saturday at Hedges Boyer Park in Tiffin. Nickels would see her season end, finishing 26th overall. Galion’s Braxton Tate nears the finish line of the regional meet at Tiffin’s Hedges Boyer Park. Tate finished seventh overall to advance to next week’s state meet at National Trail Raceway in Hebron.